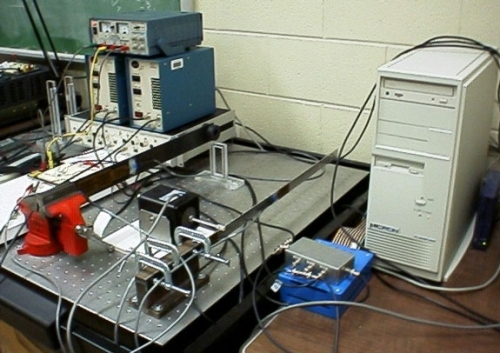 The use of piezoceramic actuators to control the vibration modes of an aluminum beam is currently under study. Research includes work with neural networks and fuzzy logic, as well as classical control methods. This technology could easily be used for any number of industrial applications where undesired vibration modes cause performance problems. The actuators are fastened to the beam and are used to counteract an imposed vibration on the beam. A picture of this experiment is shown below.